Dalton Trumbo, subject of a new film about his life, 'Trumbo', was the writer of 'Lonely are the brave' - a cinematic favourite. In the strange, empty period between Christmas 2011 and New Year 2012, I was working on a script for a charity fundraising film. In between times I kicked my heels, ate too much Christmas cake, and watched TV. One afternoon, while scanning the TV schedules for something not too mind-numbing to watch, I saw that my favourite film was being shown on Channel 5. I immediately tuned in. Few people seem to have heard of Lonely are the Brave. Even fewer have seen it. Yet watching it is always rewarding, not least because it is a literate, involving movie. And while the opening scene displays all the hallmarks of a typical Western, it’s anything but. A cowboy, played by Kirk Douglas, is resting beside his horse, using his saddle as a pillow, Stetson covering his eyes. Almost immediately, we hear a sound we don’t expect: a jet engine. Douglas looks up, and the camera cuts to his point of view. We see three warplanes and their vapour trails in the sky overhead. ‘Time we took off, too’ says Douglas to his horse. The story that follows is one of an itinerant cowboy whose way of life is at odds with the modern world. We soon discover that he hates fences; he cuts his way through a wire barrier early in the film. And, when he gingerly coaxes his nervous horse across a busy highway, incurring the wrath of passing motorists who hoot and swerve to avoid him, we get a chilling foretaste of the film’s ending. A couple of years before making Lonely are the Brave Kirk Douglas had played the lead in Spartacus for Stanley Kubrick. Douglas asked the writer that Kubrick had used, Dalton Trumbo, to write a screenplay based on an Edward Abbey novel, The Brave Cowboy. Dalton Trumbo was an interesting man, to say the least. He had left-leaning tendencies, had joined the Communist Party, and not surprisingly had been blacklisted during the McCarthy era. Around this time, he served a six-month jail sentence for contempt of court. But he also happened to be a superb screenwriter, with many great films and two Oscars under his belt. In addition to Spartacus, Trumbo wrote Exodus for Otto Preminger. It has to be said, though, that both of these screenplays were written under aliases and it was Kirk Douglas who ‘outed’ him as the writer of Spartacus long after the film was released. By this time, the 1960s, the McCarthy era was long gone, of course. As well as a first-rate screenwriter, the movie has a first-rate cast. Walter Matthau plays a world-weary sheriff who sets out in pursuit of our cowboy with a grudging admiration; and George Kennedy is a sadistic prison guard who deprives Kurt Douglas’s character of one of his back teeth. The actor who portrays the truck driver, Carroll O’Connor, went on to become famous as the lead in the American version of Till death us do part as Archie Bunker in All in the family; while, a one-armed man who picks a fight with our cowboy in a bar later appeared as the elusive one-armed man in the long-running television series, The Fugitive. 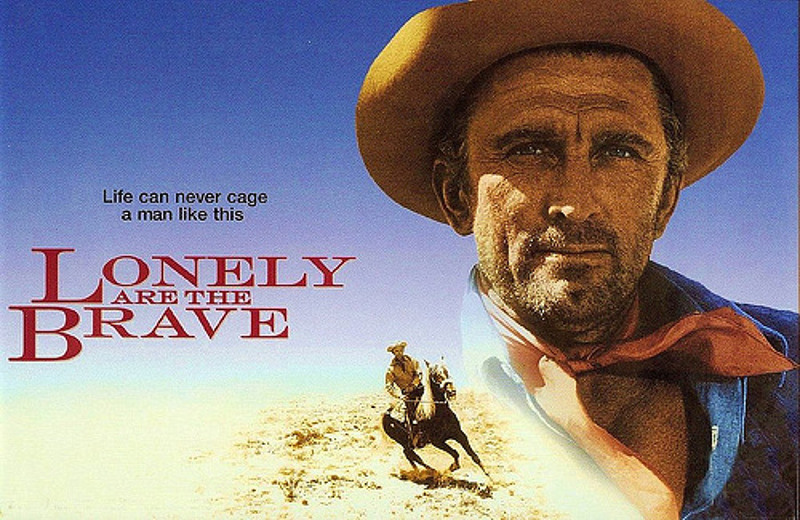 If you ever get the chance, watch Lonely are the brave. It’s what you might call an unsung hero of a film and Kirk Doulas reckoned it was the best work he ever did. It certainly stands as a testament to the talent of Dalton Trumbo. If the Trumbo movie is anything as good as the man himself, or, indeed, Lonely are the brave, it will be a treat to watch. Trumbo opened in the US in November, starring Bryan Cranston from Breaking Bad in the title role. It’s due to start screening here in February, so watch out for it.